This sweater grew out of Amaran's Redwall sweater. The front and back are identical. The castle is in shadow against a lightening blue sky. Dark green trees make up the foreground. The sleeves have one tower as the focus. A simple pattern in greens and blues circles the hem and wrists. The neck, wrists, and hem have an alternating fold-over pattern of black and varying green stripes. On the front are Joseph and Mary, with Jesus wrapped in white swaddling cloths. A shepherd and sheep are on the back. The sleeves have variegated green and blue clothed angels with mohair wings. The wrists and hem have varying green ribbing. The neck has varying blue ribbing. I love the colors of this sweater. It feels soothing to me somehow. I think it is also similar to a quilt I made, with a landscape outside windows. The subtle green and blue trim pattern echoes the church window shapes, and the periwinkle lace points at the hem adds to the theme. I like this sweater, but I am troubled by how the green of the dragon does not stand out enough against the background of the green mountain. I need to rethink these colors. The dragon on the front draws closer to the castle on the back. The sleeves are just fire against a blue sky. The neck, wrists, and hem trim is alternating stripes of dark blue and fire colors. This is a sweater for autumn and the lovely colors in the trees at that time. Most of the fun for children is raking the leaves into a pile, which happens on the back. This sweater takes alot of concentration to knit, as the falling leaves do vary in colors and the yarns need to be carried to their next anticipated places in the rows. The sleeves also show the piles of leaves. The wrists and hem trim is green swirls on a varying blue background. The neck trim also has green and blue colors, with a longer swirl and crosses. Who doesn't like lighthouses? I didn't even do the iconic red striping on this one - that would be easy to add. This is such a simple sweater, with a nice tug boat on the back and a sailboat on the front. The island with the lighthouse wraps around the sweater. The waves are three shades of turquoise and the sky is bright blue. The large sun wraps around one shoulder. The neck, armholes, and hem is ribbing stripes in shades of blue. At first when Leif began reading the Moomintroll books to our children, I didn't like them(!). This also happened with Frog and Toad, which later became an absolute favorite. What is with my first impressions? Now Moomins are a remembered treasure for our children, and our granddaughters have stuffed Moomins to play with. 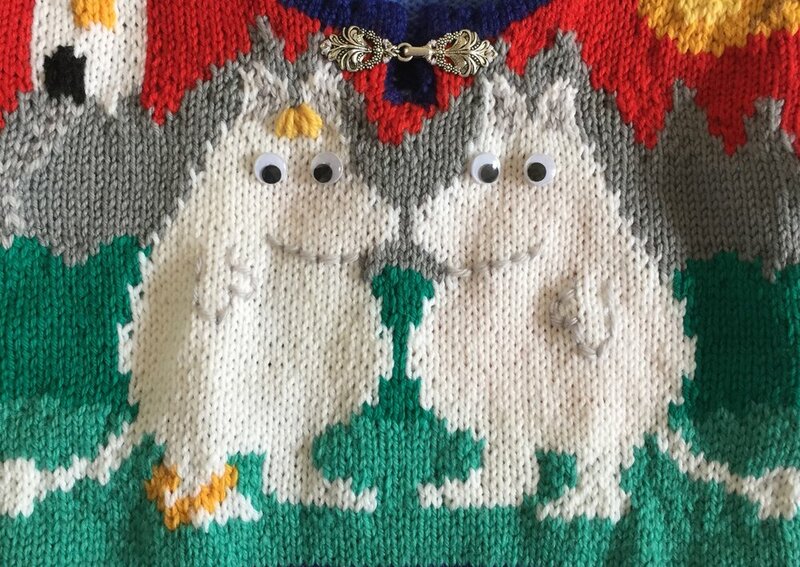 This is a smaller adaptation of the Moomins Five Years sweater. This was made for little ones, so the pewter clasps and no sleeves make this easier on and off. There is a nice lace pattern in dark blue at the hem as well as picot trim at the neck and armhole openings. This is from Leif's book The Undeniable Kingdom, from a scene in which Indus's mother is describing sweaters she'd made for him. Here a hand of God is holding the moon and sun in the sky. The bright light flares and rays shine down on a small country village of tiny white and black houses. The sleeves have the sun and rays, and the moon and the darkening blue sky. The neck has ribbing in shades of blue while the wrists and hem have ribbing in shades of green. We love the movie My Neighbor Totoro. Leif, who doesn't like animation, appreciates its gentle depictions of nature. Jirina has gone farther, being influenced by further Miyazaki movies such as Nausicaa and Princess Mononoke. Spirited Away remains one of the most surreal movies I've ever seen, in the best way! But the Totoros are the best for little children, because they are so adorable. 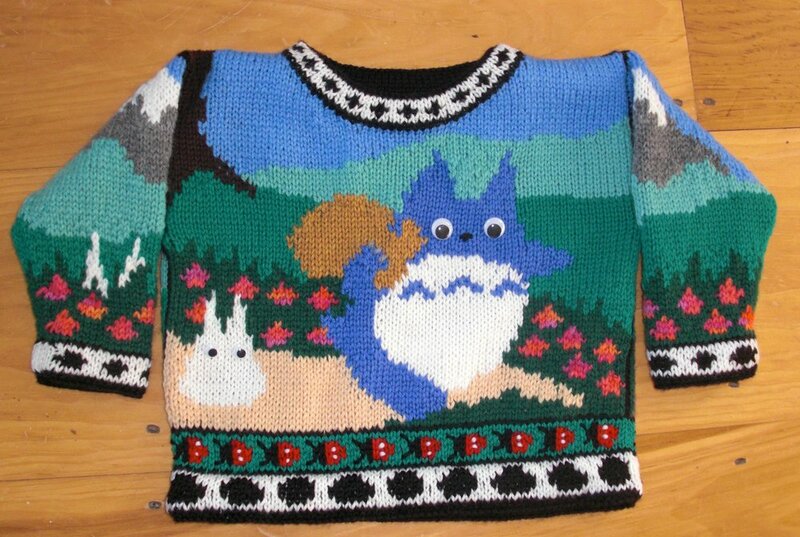 This is a variation of a Totoro sweater I made for Levin when he was one, way before he even saw his first movie. 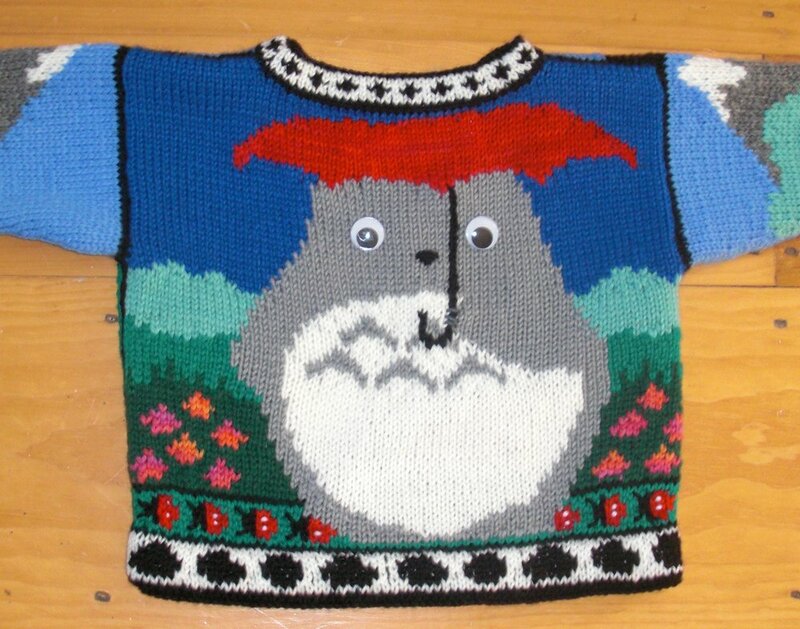 I have since made so many Totoro sweaters in so many different sizes. They are always fun to make, with more details or fewer, with solid colors or variegated colors. The trims and trim colors change also, depending on the size. 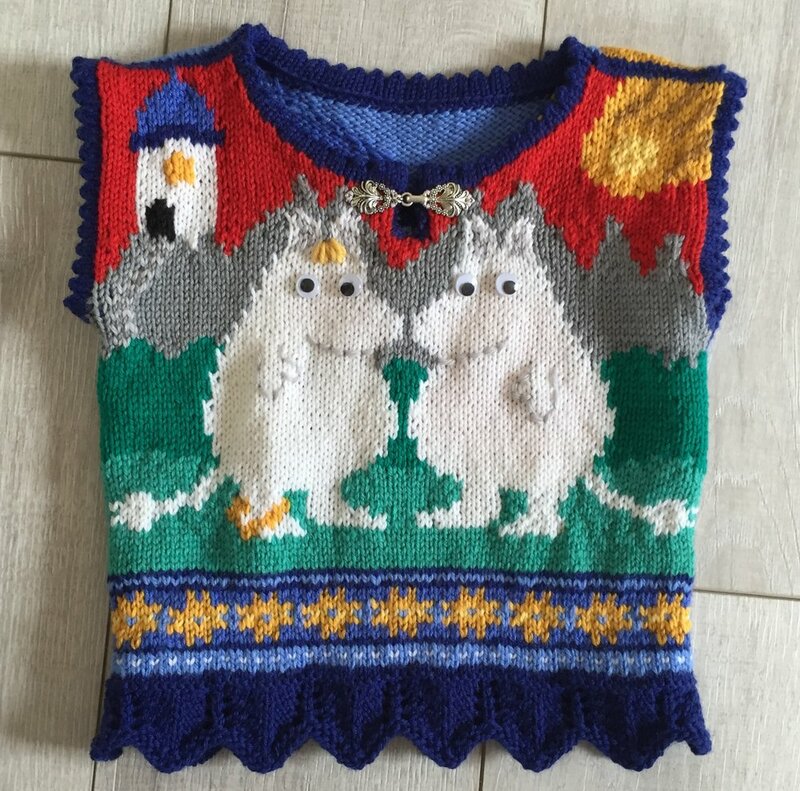 This sweater has the little blue and white Totoros with their bag of Acorns running down the path on the front. On the back the larger grey Totoro stands under a red umbrella. The sleeves show just the ears of white Totoros peeking up from the greenery, with a mountain in the background. The trims are the soot spirits in black on white and ladybugs crawling around the hem.